Chile con queso (Spanish for "chile with cheese"), sometimes described simply as queso, is an appetizer or side dish of melted cheese and chili pepper typically served in Tex-Mex restaurants as a sauce for nachos. 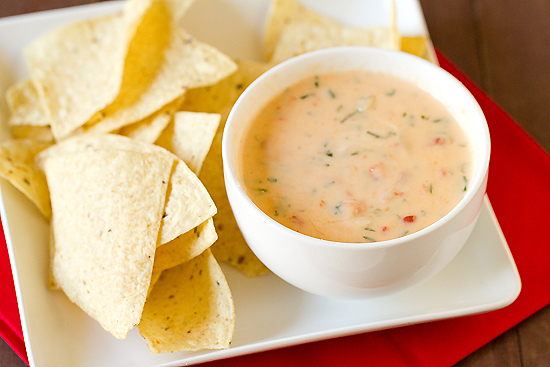 Chile con queso is a smooth, creamy sauce, used for dipping, that is made from a blend of melted cheeses (often Velveeta or another processed cheese, Monterey Jack or cream cheese), cream, and chili peppers; the latter sometimes in the form of the canned tomato and chile pepper mix sold by Ro-Tel. Many restaurants serve chile con queso with such added ingredients as pico de gallo, black beans, guacamole, and ground beef or pork. Chile con queso is a warm dish, heated to a desired temperature. Chili con queso can be eaten with tortillas, tortilla chips, or special queso chips which are thicker than regular tortilla chips. It can also be used as a condiment on fajitas, tacos, enchiladas, migas, quesadillas or any other Tex-Mex dish. Tex-Mex restaurants usually offer tortilla chips and salsa as appetizers, free of charge. Chile con queso is usually offered for an additional charge. It can be made with various cheeses. Usually it is white or yellow in color. Although chili con queso is commonly called "queso", it should not be confused with "cheese dip," which is specifically cheese without the peppers. Recipe for Chile con queso see Here and Here.